Despite the freezing temperatures, there are swans and waterfowl in the Alma area today. There over a thousand Tundra Swans in pool 4. 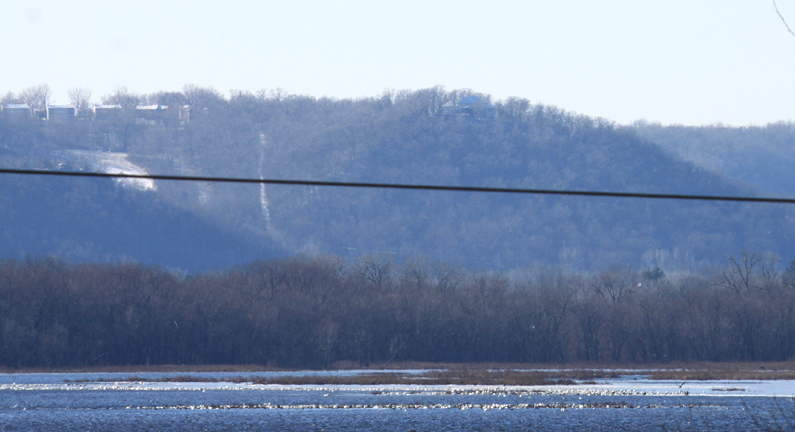 You'll need a spotting scope to see them from the riverfront at Cedar Ridge Resort. This photo was taken looking up-river. There are more just down-river past Jay Hawk Ranch (best seen driving up river - but be very careful if you decide to pull off State Rd 35 to watch). The Mississippi River is icing up, as are the shallow ponds and sloughs - where the swans and puddle ducks forage. 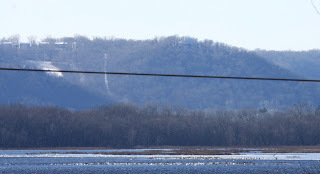 We spotted a 5 swans sitting on the ice in front of the observation deck at Rieck's Lake Park, and 5 more further back on the open Buffalo River, bathing. A nice surprise: close-to-bird views. They were joined by dozens of noisy Canada Geese and only a few Mallards. 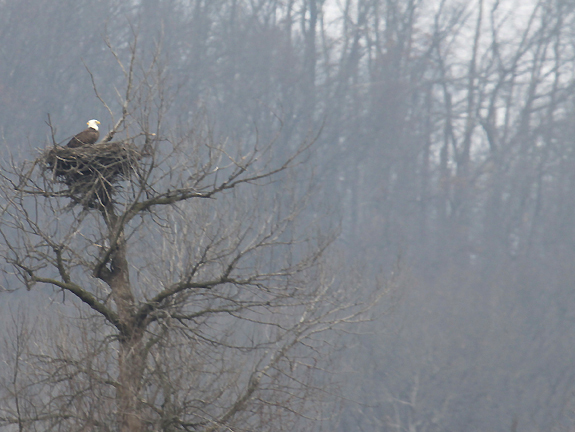 We spotted a dozen Bald Eagles flying overhead, in the cottonwoods along the river and in pairs, working on their nests. Look for Red-tailed Hawks hunting from trees along the roads and a Rough-legged Hawk, hovering over the recently harvested corn fields on the river side of the Tell Farm on State Road 37.